Cheikh Diop's American dream is to return to his homeland. But he can't go back to Senegal when the only things keeping his wife and children out of destitution are the dollars he sends them. "Yes, I miss them a lot," said Diop, 48, who sells socks and T-shirts from a shared Harlem storefront, nearly two decades since he arrived, alone and unconnected, to make money. For all its freedom and opportunity, New York remains a city filled with Cheikh Diops -- far-flung immigrants often surprised by the challenges of mere survival in wealthy America, and longing for home. The desire to return is keen among the fast-growing number of Africans in the city because of their strong traditions of kinship and cultural distinctiveness. Yet the economies and instability that forced many into exile are only worsening in many cases. "Everyone wants to go home, but no one does," said Alex Kabba, the Nigerian-born editor of African Abroad, a weekly newspaper with offices in Flushing. "It all boils down to economics. You can be home, yes -- but with no job." Gradually, over the past two decades, New York has emerged as the largest single destination in the U.S. for people from such countries as Senegal, Ghana and Nigeria, according to the federal 2000 Census. About a third of all Africans who move to the U.S. end up in the city. The census that year counted 92,435 Africans in the five boroughs, more than double the population of a decade earlier, just behind immigrants from Haiti and ahead of the total from Colombia or Russia. A like number of second-generation Africans, born in the U.S., are advancing through the city's schools and colleges. Possibly the most common image of Africans is framed by the sight of the men hawking watches from fold-up tables on Fifth Avenue or women braiding hair in their salons throughout the city. But Africans typically meet with professional success. Many arrive with college degrees. In neighborhoods already diversified by immigration, they say they've faced little of the discrimination weathered by African-Americans or even by their own counterparts in France amid that country's current spasms of nationalistic fervor and violence. Peter Lobo, a demographer with the city's Planning Department, describes the upward mobility of Africans in New York as part of a "brain drain" in Africa, where the most resourceful and educated men and women leave for income and opportunity unavailable at home. Often fluent in English upon arrival, Africans have fanned out across New York, living on the fringe of African-American neighborhoods in East Harlem, Jamaica, West Bronx, Bedford-Stuyvesant, Bushwick and Stapleton and working as attorneys and home attendants, travel agents and child welfare caseworkers, teachers, fabric and crafts importers, architects, and car-service drivers. Compared to Middle Easterners, Africans have generally escaped the impact of the tightening of enforcement of federal immigration laws since Sept. 11, 2001, including increased detentions and deportations. "I see many of them thriving," said Linda Beck, associate professor of political science at Barnard College who studies the new African diaspora. Their stories are layered Diop, impoverished despite his job in Senegal as a landscaper, arrived at Kennedy Airport 18 years ago on a travel visa, finding his way to a hotel room in Harlem for which he chipped in $15 a night with four or five strangers. Over the next decade, he worked his way to an apartment nearby with other French-speaking Africans. He says he now sees his family once a year or two years, as the cost of a round-trip ticket is high -- about $1,500. Kabba, 44, who lives in the Jamaica section of Queens, won political asylum here in the mid-1990s after being detained and threatened for his articles criticizing the former government of Nigeria under former President Charles Taylor. The 4-year-old newspaper he helped start, with offices in Flushing, is aimed at Africans across the country, selling 45,000 to 60,000 copies a week, he said. Lamarana Balde, 40, of Guinea, drove a gypsy cab during his first 10 years in New York. Eight months ago, with help from an uncle back home, he opened a small African restaurant in the Harlem neighborhood known as "Little Senegal" along Frederick Douglass Boulevard around 116th Street (where a Dominican-owned bodega caters to Africans with canned milk, a fruity soda and phone cards, and the video store, Nouha, sells out of concerts by Youssou Ndour, something of a cross between Bob Marley and Sting). Balde and his wife have four children, all born here. "I cannot afford to go back," said Balde, whose mother and sister live in Guinea. "Plus, Guinea is dangerous. Just coming from the airport, you could be shot for whatever you have." Experts say Africans, like other immigrant groups, pay a price for clinging to their "myth of return" -- the term academics use for the messianic hope of reunification with the world they knew. Africans have yet to run for political office in any noticeable numbers, and their network of self-help organizations is lean, although their involvement in mosques and churches is more muscular. Adjustment is slowed, too. In America, most African women have to work, a departure from traditional roles. 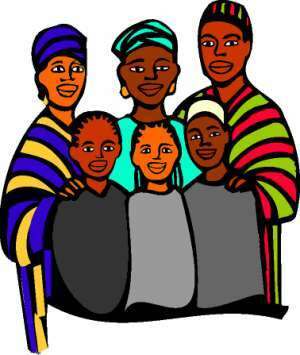 Bigamy, illegal here, is a sign of wealth in some African cultures. While American children are supposed to look at an adult when spoken to, in some African societies it's disrespectful to do so. And here, from the perspective of most Africans, kinship takes a back seat to the importance that Americans place on their government to help them in times of crisis. "There's a cultural divide, and a lot of confusion," said Grace Ogiehor'enoma of Elmont, an Elmhurst Hospital Center nurse who started the Nigerian Nurses Association to help Africans overcome American-style stress, overeating, and unfamiliarity with the concept of regular health care. Still, whether they're ready to believe it or not, Ogiehor'enoma says, Africans in New York are here for the long haul. "By the time you think you're in a position to go home again, your life is almost over, and old age is here," she said.